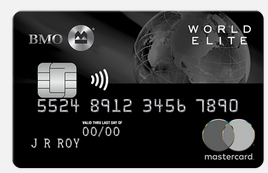 The news around the BMO World Elite Mastercard changes that came out in November has been met with disdain by most if not all of the cardholders. This is based on the emails we have received and the comments posted on our post detailing the change. You can read that post and all the comments here. One thing we have been wondering and asked before is whether the sign up bonus on the card will remain the same at 20,000 points or if it would be increased due to the lower base value of the BMO Rewards Points. Well the good news is that the bonus has been increased and is actually more valuable than on the old version of the card! That being said, don't be swayed by that as they are just trying to make for the lower overall earn on the card. The new sign up bonus is 35,000 points when you spend $3,000 on the card in the first three months of having it. More points yes but now you have the spend requirement. For most people who apply for this card, the $1,000 a month for three months should be easily achievable. Under this new points format on the card this new sign up bonus is worth $250. That's $50 more than the old bonus and for now they are keeping the limited time offer of having the first year's annual fee waived on the card. Ideally this is a really good sign up bonus for people who want to take advantage of the sign up bonus and the Priority Pass membership with 4 lounge passes at no cost other than your spend. For most, you shouldn't look at this card as a long term card unless all your spend on it is strictly in the travel, dining and entertainment categories to achieve the 2.14% return - but then you have to deal with BMO Rewards for all your travel bookings and redemption options - and based upon comments from our readers and even our own Jeff F., the BMO Rewards Centre is a hassle to deal with. Once the 35,000 point bonus posts, use it and the points you earned for the $3,000 in spending to redeem for some travel - ideally flights as BMO Rewards should be competitive there (not always the case though) and remember you don't have to have all the points, you can mix points and cash. Once your travel is done, cancel the card before the card renews after 1 year otherwise you'll be paying the annual fee. You don't want to cancel the card prior to travelling however as the Priority Pass membership will be cancelled when your card is cancelled. Despite the changes its not a terrible card. Is it less valuable than the old version? Absolutely but it is still better than a good proportion of the cards on the market but on the flip side there are a healthy amount of cards that are also better than this card. Now let's here from you! What do you think of the revised sign up bonus? Is it enough to make you take a crack at this card? And would you keep the card after the first year or dump it for another?